Liquiteria closed this past Friday after 22 years on Second Avenue at 11th Street. However, the space may not remain vacant for too long. Christopher Pugliese, the owner of Tompkins Square Bagels, is exploring taking over the storefront, partnering with Taras Strachnyi, who runs beQu Juice on Ninth Street, for a quick-serve juice spot and health-focused cafe. "We have already seen the inside and have a decent rent in place," Pugliese said. "The aim is to bring the old Liquiteria vibe back to the original space. I think we both agree that the juice business has gotten a bit too corporate and sterile." In Pugliese's opinion, Liquiteria was kind of the Tompkins Square Bagels of the juice business until founder Doug Green sold the business several years ago. "We want to bring that feel back into the business. Give it the same feel and vibe of Tompkins Square Bagels," he said. "We’d offer organic juice made to order. None of this pre-bottled nonsense. This means we would have an actual staff who would interact with the guests. I know that’s not in vogue these days but that’s how we are going to do it. We will probably have healthy breakfast options too." 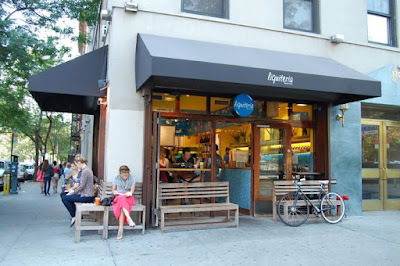 Pugiliese opened Tompkins Square Bagels on Avenue A in December 2010. The Second Avenue outpost arrived in November 2016. As for this new, unnamed venture, "We are going to try. We hope to pull it off."